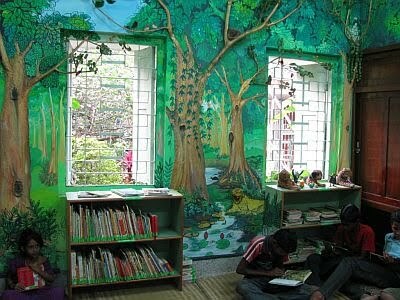 I had visited this place last year, when I was doing my annual round of learning from the social ventures who work on the ground, and make a difference.... A friend of mine in XIMB had suggested that I should visit Bakul Foundation in Bhubneshwar, and gave me the address and the contact... a library for those who can't afford books! Over the last decade or so Satya Nagar in Bhubaneswar has morphed from a sleepy residential area to a commercial hub. When you go straight down the road from the brash, new Big Bazar in the area you hit a reasonably sized, unremarkable two storied house numbered 16 that is painted white and looks as boring as any other house on the lane. But you cannot miss a signboard that is essentially a piece of carved and painted wood that says ‘Bakul Sishu Paathaagaara’ (Bakul Children’s Library) in Oriya. A small gate leads you into a space that looks as unlike a library as you can imagine. Of course there are books all around; but you have pictures of joyous monkeys playing on the walls and every inch of the walls painted cheerfully with one motif or the other in soothing bright colours. But the physical aspect of the library is perhaps the least unusual thing about it. The Bakul library is one of the largest children’s libraries in the state of Orissa. It houses more than 8,000 books (primarily in Oriya and English, and some in Hindi) as well as multimedia and other educational material. There are no user charges for reading and referencing in the library, and there are no formalities involved in terms of becoming a member till now. Any child can drop in and read. 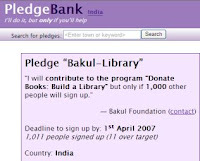 Lending of books has not started, and a small fee might be levied as and when it starts. 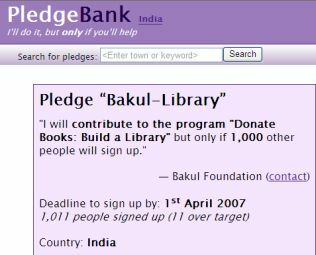 The library is run by the Bakul Foundation, with Dr Jatindra Nayak, Professor of English Literature, Utkal University as President, and is managed by volunteers Sujit Mahapatra and Satyajit Puhan with help from Puspalata Sethi and others. ..about creating environmental awarenessthrough innovative means, e.g., by gifting saplings on birthdays, child births, and weddings so that people will have an emotional connection with the gifts and therefore take responsibility for nurturing and caring for them: "We are not thinking of a mere event or activity. 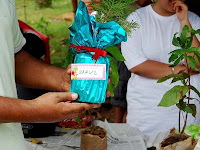 We are attempting to create a sub-culture around tree plantation, where trees can become a part of the everyday lives of people... We are trying to introduce an emotional connection between people and trees."